... for the use at motor control units. 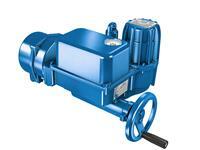 s-range Actuators for conventional sytems, parallel hard wired signals. Torque and position measurement by microswitch. Intermediate position via conductive plastic potentiometer and analogue position transducer. For optimum integration of s-range actuators into a plant, additional components such as reversing contactor combinations, PLC (hardware and software function blocks), power supply units (for heating, contactors and signals), and positioners have to be installed externally into the process control system and the low voltage switchboard.